Introducing our Pet Portraits by Melanie and Nicholas. If you have just landed on our Art Studio Blog and this is the fist post you are reading – welcome! We are delighted to see you here and are glad that you dropped by. In a nutshell, Nicholas and myself are professional pet portrait artists. 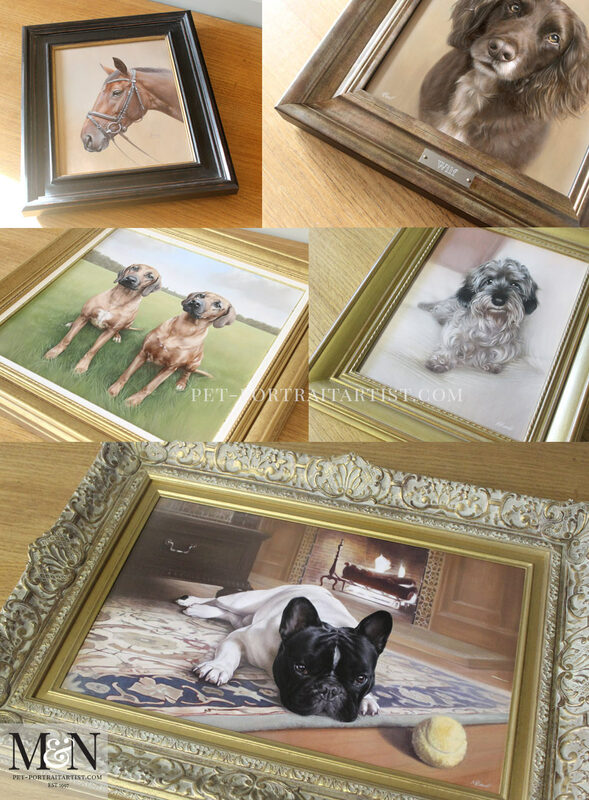 We have been creating pet portraits for clients worldwide for over 20 years. We are established in our business and the way we work. Nicholas and myself specialise in creating portraits of pets from clients own photos. We use both oil paintings on canvas and pencil drawings on paper. Both having used many mediums over the years, we have honed our skills on two of the most important mediums in art. Traditional oil paintings and of course timeless pencil drawings. Both medium were used by the old masters. There are no other mediums quite like them and they allow us to portray pets in a very realistic and three dimensional way. We do of course have a website what you can look around, Pet Portraits by Melanie and Nicholas, however our blog is a much more candid place to be. We post stories of select commissions that we create through the year that we feel prospective clients and readers might be interested in. Not all of our portrait are posted. We are alway working hard on our paintings and drawings in our Art Studio and creating blog posts takes time and dedication. We want each post that we create to be of interest to our readers. So we choose the most interesting commissions for everyone to see. Nicholas Beall completes all of the oil paintings. He has been painting in oils for many years and it is his absolutely favourite medium to paint in. The portraits he has painted over the years are absolutely stunning. I have tried to gather a collection below as a montage of some of his favourite portraits for our readers to view. You can of course also visit his dog pet portraits, cat pet portraits and horse pet portraits galleries to see them in more detail. As you probably know by now, my name is Melanie Phillips and I am the other half of Melanie and Nicholas pet portraits. Although I have painted and used other media over the years I have always been fascinated by graphite pencil. From the early years at school where my art teacher encouraged me to venture into a world of colour, I was quite happy with my black and white renderings. 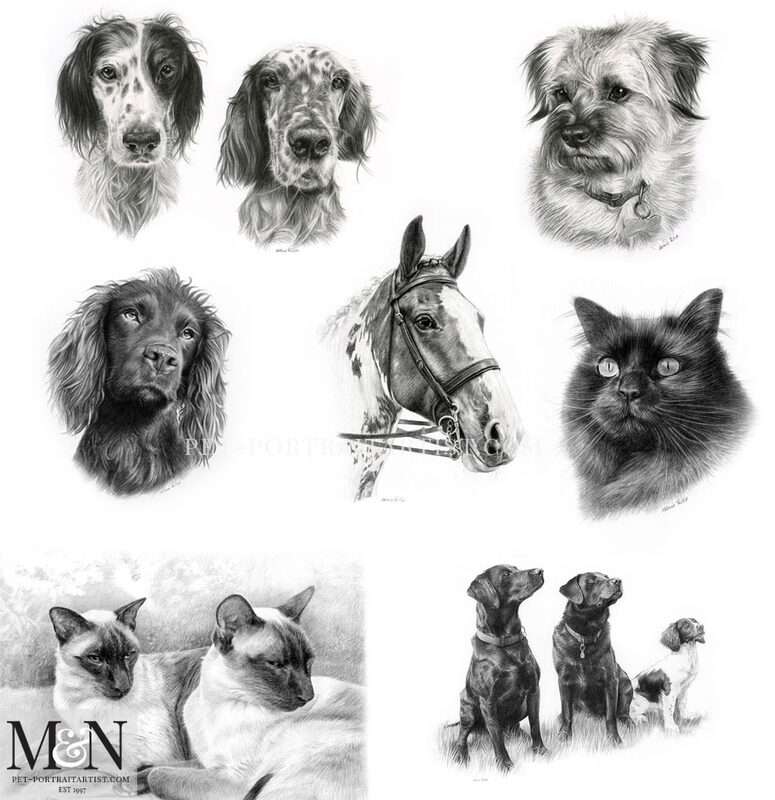 Id like to think I have honed my skills a little since leaving school and I have added a collection of my pencil pet portraits below for you to see. I love working with my clients on special commissions. The portraits where they are going to be a complete surprise. Often clients send video of the recipients opening the pencil drawings on a special birthday or anniversary and it brings tears to your eyes to watch them. It really makes both of us proud to know that we can bring back wonderful memories for family who have lost their pets. it really means a lot to them and equally means a lot to us too. Pet Portraits by Melanie and Nicholas – who are you!? Nicholas Beall is my husband and he is the oil painter between us. My name is Melanie Phillips and I am the writer of our website and blog. I am also the pencil portrait artist. We have been drawing and painting together since we left college in 1994. Officially starting our business in 1997 we painted pet portraits prior to that for friends while at art college. We studied Natural History Illustration which is the study of plants, animals and wildlife. Nicholas and myself were professionally taught for 4 years and so received a wonderful grounding in art. Nether of us would do anything else. We love our jobs, we love working with our clients. We also love living in the heart of rural Wales in our little 350 year old cottage. You can read all about our Little Welsh Cottage on our website which we have been renovating over the years. Not forgetting of course living with our wonderful Tibetan Terrier Lily causes all sorts of hilarity every day of our lives. If you would like to read about her and see photos, hop on over to our page all about her – Lily the Tibetan Terrier. How can I commission a Pet Portrait? If clients are new to commissioning a pet portrait it can be a very daunting process. After all, many of our clients have never met us. They are trusting us in creating a beautiful portrait of their beloved pet. Clients need to know that we will not only capture their pet correctly, but also that we will create them a drawing and painting how they envisaged it to be. So all of this needs to come across in our website. Which is why we have so much information about who we are, what we do and what have done for clients over the last 20 years. Photos are key in the pet portraits process. We rely heavily on our clients to provide us with the best possible quality photos they can. This will really make a big difference in the quality of the portrait. If we can see the fine hairs and details – we can add them into the painting or drawing. If your photo is blurry, it is very difficult to know what should be there or how it should be. You can take a look at our pet portraits commissioning page to read more about the process of Commissioning a Pet Portrait. We are always happy to guide clients via email or telephone too. What are your pet portrait prices? One of the questions we are most often asked is ‘ how much are your prices for your pet portraits. We do have a prices page on our website which you can access here – Pet Portraits Prices. Our pet portraits website is so very big, with such a lot of content. It can often be very difficult for prostepctvie clients to find them. We like to give as much information as we can so that clients can fully understand the process. So our prices are on one page and split into sections for the pencil drawings and the oil paintings. We can offer bespoke framing for our portraits. Nicholas and I work with a number of different framers, just let us know the kind of frame you are looking for. We have lots of examples on our website. We can then obtain a price quote for you from our framers. There is always plenty of choice with it comes to framing. It is such an important aspect for the commission. A frame can make or break a portrait. It has to not only compliment the painting or drawing but also be secondary to it. It is essential for viewers to be looking at the artwork first and then the frame – and then both together. Do you have a waiting list for your pet portraits? We are in demand for our paintings and drawings and always have a commissions list. If clients are looking for a portrait for a special date, they need to let us know in good time. Alternatively we offer our Gift A Portrait service. It is similar to a gift voucher, however it is completely bespoke to each client. You can also read more about it on our website at Gift A Portrait. As soon as you send us your details, we can send you bespoke voucher within 24 hours. Wonderful if you are a little late in organising everything. We can always be contact via our pet portraits contact page. Nicholas and myself would love to hear from you. Also to see photos of your pets, in addition, let us know your ideas for your pet portrait today!